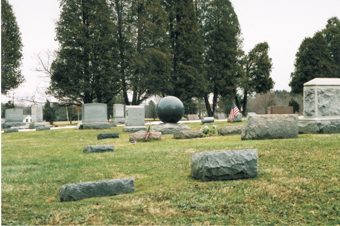 There is a spherical stone in Myrtle Hill Cemetery in Valley City said to mark the grave of a woman who, in life, was a very tormented soul. The woman was married and had several young sons. Unfortunately for the woman, all the men in her life took great pleasure at abusing her, both physically and mentally. After years of continuous abuse, the woman had had enough and plotted her revenge. She finally decided to poison the family's water supply, the well in the back yard. SO successful was the woman's plan that she ended up killing her entire family, which is then disposed of by dumping them one by one into the well. But with almost an entire family now missing, it didn't take long for the neighbors to get suspicion. Eventually the bodies were discovered and the woman arrested. Prior to her trial, she was deemed unfit to stand trial and instead was committed to a state mental hospital for the rest of her life. Upon her death, the woman's remains were relocated to Myrtle Hill Cemetery and buried beneath the round stone. That's the spot the woman's ghost is believed to haunt to this day. There is a variation on this popular legend that states the woman in question was also a witch, who turned to the dark side in order to seek her revenge. She is said to have practiced her dark craft in and around the cemetery, including the nearby woods. After the murders of her family were discovered, the townspeople are said to have stoned the woman to death. He body was then buried under the giant sphere in order to keep her from rising back out of the grave. In addition, she was also buried standing up to further make escape difficult. But it would appear as if those precautions did little good because the woman's spirit is said to have found a way to escape the grave and to return to the places she worked her magic. The stone itself has also soaked up some of the woman's evil and it will feel warm to the touch during the winter months and freezing cold in the summer. Even nature seems fearful of the grave and snow and leaves refuse to fall anywhere near the monument. 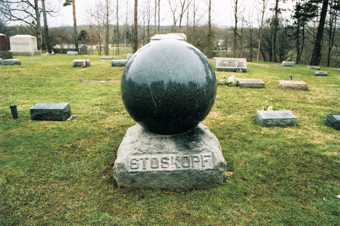 The marker in question is the sphere sitting atop a square base marked simply "Stoskopf." Stand in front of this stone and tell people that no one is buried here and they will all give nervous glances about them as they wait for a ghostly witch to come barreling out of the woods at them. But the simple truth is that no one is buried under this stone because it's not a grave stone. It's a family plot marker. Seven plots were originally purchased by the Stoskopf family at Myrtle Hill Cemetery. Today, only four of the seven plots are occupied; George Stoskopf, his wife, Alma, their daughter, Alma, and her husband, Joseph Toth. All four graves are clearly marked a short distance away from the infamous Witch's Ball. As for the stone itself, since it was designed to do nothing more than mark the Stoskopf family plot, it bears no other name other than "Stoskopf." Martha Wise is an individual whose heinous crimes have become intertwined with the Myrtle Hill Cemetery legends. During a New Year's Day dinner in 1925, Wise poisoned her aunt Lillian Gienke's entire family, including four children. Lillian lingered for several days before finally passing away. When police began investigating, they found that while she was never convicted, Wise has been suspected of poisoning her first husband, Albert Wise, and even her own mother, Sophie Hasel. Eventually, authorities had enough evidence to arrest Martha Wise in connection with the poisoning deaths. Once in custody, Wise confessed to the crime, claiming her motive was due in part to commands from the devil as well as her love of attending funerals. In 1925, Martha Wise was convicted of the first-degree poisoning of the Gienke family as well as resulting death of her aunt Lillian and was given a life sentence. Martha served her time at the Marysville Reformatory, where she became something of a model prisoner. Denied parole several times, Wise had her sentence changed from first-degree murder to second-degree and was granted parole in 1962. She died on June 28th, 1971. The aspect of the Wise crimes that would inevitably link the legend of Myrtle Hill Cemetery to the factual events in the life of Martha Wise is that several of Wise's victims, including Sophie Hasel and Lillian Gienke, are buried in Myrtle Hill Cemetery. Martha Wise, however, is not. She is buried in Marysville. 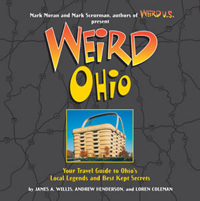 There is a legend here in Ohio that I’ve heard for my entire life. In fact, even my parents and grandparents have been hearing it for as long as they can remember. It’s called the Witch’s Ball. I’ve heard a ton of stories about messed up things happening because of it, and I’ve even experienced some strange stuff myself. The Witch’s Ball is a strange looking grave that sits in the center of the Myrtle Hill Cemetery in Valley City, Ohio. It’s a large marble ball elevated three or four feet into the air. It is the final resting place of a very evil witch who once lived in Valley City, and who still haunts this cemetery today. The story I have heard is that the witch’s name was Mrs. Stoskopf. She was mistreated by her husband and sons in many ways. They beat her and forced her to do menial physical work, basically making her their slave. Little did they know that she had turned to black magic in order to overcome them. She killed them all ritualistically, and this set off a bloodthirst inside of her. Neighbors began noticing their pets disappearing and began wondering about the lonely widow none of them knew. One night they went to her property and discovered her practicing witchcraft in her barn. There were animal bones and pet collars scattered about. In a rage, the crowd beat her to death. Before she died, she told them she was placing a curse on her own grave. They buried her standing up, as was the custom with witches, and didn’t give her a grave marker. Eventually, a relative of hers (I have heard both her cousin and her niece) placed the marker on her grave. Ever since that day, strange things have been happening in the cemetery. People report seeing the image of an eye on the ball itself. Legend has it that one can touch the ball on even the coldest day and it might be hot to the touch. If it is hot, the witch is not in her grave--she is in the cemetery watching you. Friends of mine have seen strange figures in the woods around the cemetery, and others have heard ominous laughter and blood curdling screams. When I was sixteen, my friend Stephanie and I snuck into the graveyard. She knew I was scared of the Witch’s Ball and dared me to touch it. Being a skeptic, despite my fears, I agreed to play along, sure that nothing was actually going to happen. As soon as we made our way into the cemetery our flashlights picked it out, sitting in the dead center of the graveyard. It was as if we were drawn to it. We made out way to it and without a word we both placed a hand on it. To our shock it was warm, even though it was a cool evening and the time was approaching midnight. We looked at each other in shock, then took off!